Another missed anniversary on this blog, but only a year out this time: a hundred and one years ago, in the night between 3 and 4 April 1915, a soldier on sentry duty at a barracks in Berlin wrote a poem of three verses about a soldier meeting his girl by the street lamp in front of the barracks. That soldier was the German poet Hans Leip (1893-1983), who was just about to be sent to the eastern front. He survived the war and more than twenty years later added two more verses before publishing the poem in 1937 under the title Lied eines jungen Wachpostens, 'Song of a Young Sentry'. By 1938 it had been set to the music we know today and the song released under the title Lili Marleen. It became one of the most popular songs of the Second World War, particularly with soldiers and remarkably, with soldiers of both sides. The original German version was even sung in German by the Allies, before an English version was created. The creation and history of the song is wrapped in fable, leaving only questions: did the Nazis ban the song, or just live performances of it by its original singer, Lale Andersen? ; who was the 'real' Lili Marleen? ; is it an anti-war song, or just a sentimental song about separation? All these questions we can leave to the many people who are fascinated by the song's confused history. Perhaps the song was popular because it was fundamentally unreal: a dream of a time that only existed in the imagination of separated lovers. The text looks back in nostalgia and hope. It summons up the dream figure of Lili Marleen; every soldier had one of those. Judge for yourselves, then read the dose of reality offered by Heinrich Böll – a reality specialist – that follows the text of the song. In front of the barracks, in front of the main gate, stood a street lamp. It still stands there to this day. So if we want to meet again we'll stand by the street lamp as once we used to, Lili Marleen. Our two shadows merged into one, showing how we loved each other. Everyone shall see it when we stand by the street lamp as once we used to, Lili Marleen. Then the sentry called: they are blowing the tattoo [the evening call back to barracks] – [being late] can cost you three days' [arrest]. Comrade, I'll be there straight away. Then we said goodbye, how I longed to leave with you, with you, Lili Marleen. The street lamp knows your step, your delicate walk. Every evening it still burns but it soon forgot me. Should anything happen to me, who will be standing by the street lamp with you, Lili Marleen? From the quiet room, from the surface of the Earth your beloved mouth lifts me up. When the late fog swirls I shall stand by the street lamp as once we used to, Lili Marleen. 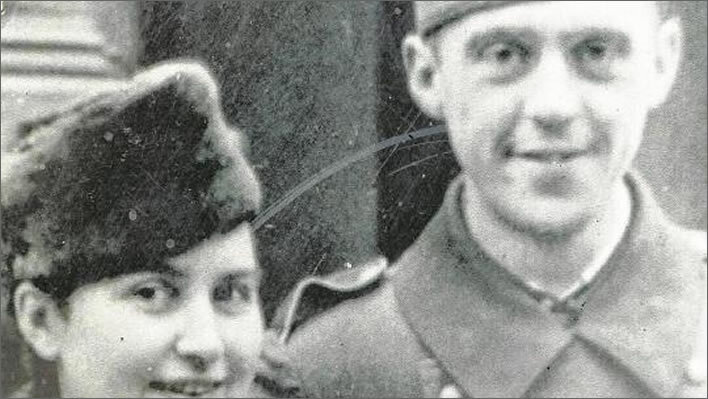 In September 1939 the twenty-two year old Heinrich Böll (1917-1985) was called up by the German Army. He served as a soldier throughout the war before he was captured by the Americans in 1945. A remarkable literary career followed, including the Nobel Prize for Literature in 1972. In 1981 he wrote an autobiographical sketch about his experiences at that time: Was soll aus dem Jungen bloß werden?, 'What's to Become of the Boy?'. Ach, Lili Marleen, du weißt doch, daß wir uns nie unter die Laterne gestellt haben! Wer stellt sich denn mit einem oder gar seinem Mädchen ausgerechnet unter die Laterne vor dem großen Tor? – in der dunkelsten Ecke an der Mauer standen wir –, und süß war’s nicht: aus deinen Armen zurück in den Männermief! Ah, Lili Marleen, you know that we never stood around under the street lamp! Who stands with a girl or especially with his girl under the street lamp in front of the main gate of all places – we stood in the darkest corner of the wall – and sweet it was not: out of your arms and back into the stink of men. Heinrich Böll with his 'Lili Marleen' Annemarie Böll on their wedding day, 06.03.1942.